Does your young reader love learning unusual facts about animals? If so, then 50 WACKY THINGS ANIMALS DO is the perfect book for hours of entertainment and learning. I had no idea that “arctic walruses are known to fight for a spot on their favorite ice sheets—even if there’s room for everyone.” until I read it on page 61 in this well-crafted book. Author Tricia Martineau Wagner has joined forces with illustrator Carles Ballesteros to create a delightful book subtitled “weird & amazing animal facts!” Each animal is numbered one through 50 and page begins with a snappy and memorable headline, then a short paragraph about the special nature of the animal. The page concludes with a paragraph of additional information called “More About _____” For example for llamas (No 49) you learn “A llama’s spit is foul smelling because they are ruminant animals, which means they have a four-compartment stomach to digest their food. The food ferments, or goes through a chemical change, then the llama vomits and chews the food again.” (Page 101) Readers will find these facts memorable and fascinating. I highly recommend 50 WACKY THINGS ANIMALS DO. 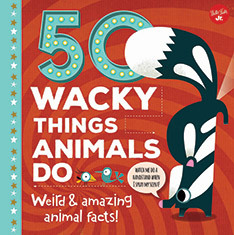 50 WACKY THINGS ANIMALS DO is full of lighthearted, easy to read facts designed to surprise, and a few may even be slightly shocking, much to the delight of most elementary school children. The first paragraph about each animal will capture a child’s attention, and then the second paragraph follows with more interesting facts about the animal. The format makes a great book for a child to read alone or for an adult to read to them, either by reading just a few pages or the whole book in a sitting. Our 2-year old grandson even enjoys just looking at the pictures and either naming or having us name the animals for him. I recommend it! What a wonderful way to introduce animals to children--a book that is hard bound, good size to hold, great illustrations and fun to read. The choice of animals and the specific characteristics that are unique to each really appeals to a child's sense of curiosity. I like the format for presenting each animal and the way the author, Tricia Martineau Wagner, capitalizes on the imagination and experience of a child in describing the particular animal's traits and idiosyncrasies. I can see this book as a "self-read" or a "read-to" addition to a child's home library. What a fun, fun book. I bought a copy for a friend and also for my family. The illustrations are colorful and add to the whacky, fun filled facts. I love that you have the crazy animal behavior tidbits coupled with something scientific. I wish I had had this type of book when my children were small. They absorbed animal facts like candy and would have enjoyed a book like this so much more since it is teaching you something informative in a fun factual way. How great is that?! I bought this book for my nephew who, like most kids, loves animals. Although it's marketed as a children's book I thoroughly enjoyed learning about all the fun and unique animal facts! I showed the book to several co-workers who ended up buying it for their kids. The comment from one was this book is "super cute" and "can't wait to get for my kids". The illustrations are terrific and mean that even younger kids than the recommended age are interested in the book and learning.